German comedian Martin Sonneborn is well-known for jokes bordering on the tasteless. But a satirical political billboard of him posing in blackface makeup as US President Barack Obama is sparking outrage. “Ick bin ein Obama (I am an Obama),” reads the poster at Berlin’s central Ernst Reuter Platz square, in an apparent play on John F. Kennedy’s famous “Ich bin ein Berliner” speech. On the poster, a "black" Sonneborn smiles as he raises his arm in the air. The billboard is the latest in Sonneborn’s campaign for his satirical political party Die Partei ahead of state elections in Berlin this Sunday. It’s meant to make fun of the entire German political establishment and go up to the edge of propriety – another poster is entitled “MILFS against Merkel” and the campaign has also mocked the neo-Nazi National Democratic Party. But the latest one is upsetting to some because of the racial connotations of blackface theatre, which was widespread in America in the 19th and early 20th centuries. Based on ugly stereotypes, blackface consisted of white performers painting themselves black for degrading minstrel shows. It it quickly died out in the United States after the Civil Rights Movement in the 1960s. 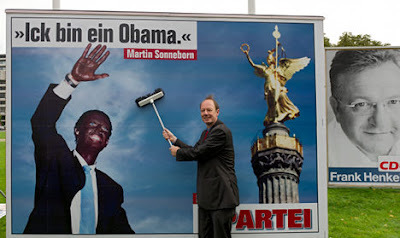 In an interview with The Local on Thursday, Sonneborn, staying in character as the leader of Die Partei, said his billboard wasn’t racist. He said he was “Germany’s Obama” and added he was mocking the “hype” surrounding the US president. Sonneborn, formerly editor-in-chief of the German satire magazine Titanic, said he wasn’t aware of the history of blackface and didn’t care if anyone was upset. But Tahir Della a spokesman for the Initiative for Black Germans (ISD), which tries to represent the interests of the black community in Germany, called the billboard "unbelievably hurtful." "This is 2011 and not 1950," he said. "I find it racist through and through." Quaide Williams, the vice chair of the German chapter of Democrats Abroad, also said the poster was insensitive, although he emphasized that he was speaking for himself and not the organization. There have been several incidents in recent years involving Obama that have led to charges of racial insensitivity by Germans. In 2009, a frozen food company released Obama chicken fingers but later said it wasn’t aware some might see overtones of stereotyping blacks with the product’s name. That same year, Dresden’s Zoo renamed a mandrill – a monkey-like primate – it had called Obama after an unfortunate attempt to "honour" the US leader. But the blackface billboard incident comes on the heels of an open letter by the US Ambassador to Germany, Philip Murphy, lamenting racism in the country after one of his black staffers had to endure abuse following a football game in Berlin. The US Embassy said it had no immediate comment on the Obama billboard. a couple of years ago when Sonneborn was the chief editor of a famous German satire magazin he got pretty fed up with how uninspirational the traditional parties in Germany had become which had resulted in major vote gains for the NPD (the German Neo-Nazi-Party) in some state elections. So Sonneborn decided to counteract by founding his own semi-fake-party, simply called "The Party" with the satirical motto "we can be even more tasteless than the NPD". This sunday Berlin will elect a new state parliament (Berlin = one of 3 German city-states). As always the election campaign of the NPD for this election has been pretty ugly, agressive and borderline anti-constitutional. E.g. they put up posters with NPD-leader Vogt on a motorcycle and the sentence "Rev it up!" (in German: Give Gas!). So true to the motto of "the Party" Sonneborn only tries to say: "You find our poster disgusting? look at the posters of the NPD! Where is the outcry about that?"